This is a 5 day training program that teaches maintenance personnel the principles of industrial hydraulics technology including basic calculations for fluid pressure and flow and actuator velocity/rpm. Starting with the practical ideas of force, area, pressure, fluid flow rate, cylinder speed, hydraulic motor speed, hydraulic power and hydraulic system heat production, students develop their understanding of how hydraulic powered and controlled machines work. Students learn about all of the major groups of hydraulic components. They will learn the function and principles of operation of direct operated and pilot operated relief valves, direct operated and pilot operated pressure reducing valves, direct operated and pilot operated directional control valves, check valves, pilot operated check valves, fixed displacement pumps, variable displacement pumps and accumulators. Students develop their understanding of the 12 basic hydraulic circuits most often used in industrial hydraulic systems. These circuits are: system relief circuits, multiple system pressure relief circuits with low pressure vent, port relief (intensification relief) systems, cross port relief circuits, counterbalance circuits – with and without load holding P.O. checks, sequence circuits, high-low pump unloading circuits, load sensing circuits, pressure compensated variable displacements pumps with safety relief valves, regenerative systems and meter-in vs. meter-out speed control (throttle valve principle) and accumulators as auxiliary flow sources (accumulator safety blocks). A substantial amount of time is devoted to teaching students how to ‘read’ and interpret hydraulic symbols. This is accomplished through the use of special handouts of ISO standard symbol diagrams. This 5 day training program is approximately 50% lecture and 50% hands on lab exercises. 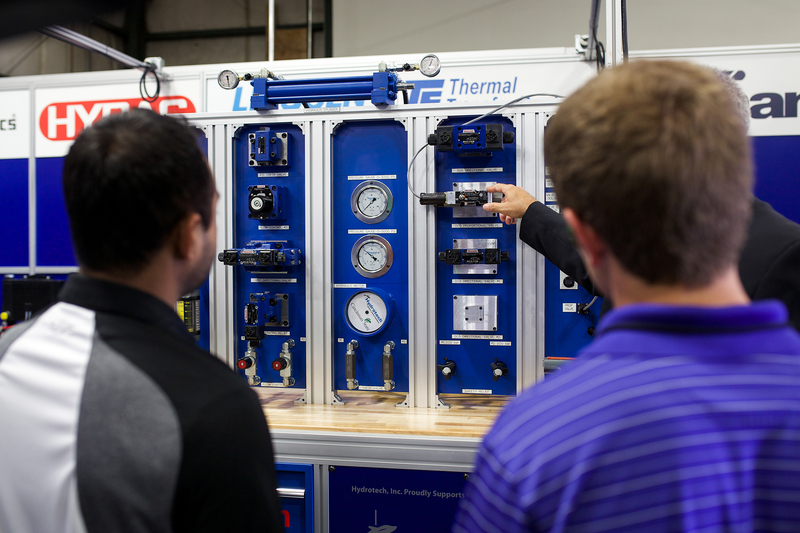 The lab exercises reinforce the students understanding of hydraulic valve functions and of the hydraulic circuits previously listed. Understanding hydraulic energy and hydraulic power – Heat production of hyd. sys.